The Beach is Always Calling My Name! Once again, I went MIA from my writing. I get a little sidetracked, a little off kilter, or maybe just distracted! My first reason for getting sidetracked was a trip to Galveston, TX. 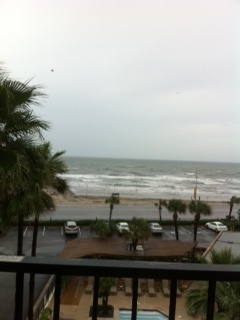 I love Galveston and I love the beach! Anything and everything about it. And we live less than one hour away from Galveston! It was rainy the first day, but who cares? I would have sat on the balcony in the rain the entire time, if I had to. Thankfully, the sun came out and it was great weather the next two days! Mr. was attending a conference, so I hit the streets and did a little shopping. 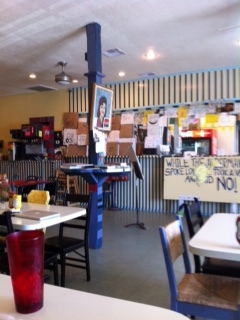 We ate at a quirky little hamburger place called Blue Water Grill; a bit eccentric and odd. Something you might see on “Diners, Drive-ins and Dives”. This one would definitely qualify as a dive, but they have the best burgers! Number two was just me not writing. That’s it, nothing else. But the biggest distraction was a wonderful distraction. Mr. took me on a cruise for my 50th birthday! We love cruises. This was only our second one, but we were hooked after our first one. Me and Mr……we could live on a boat! 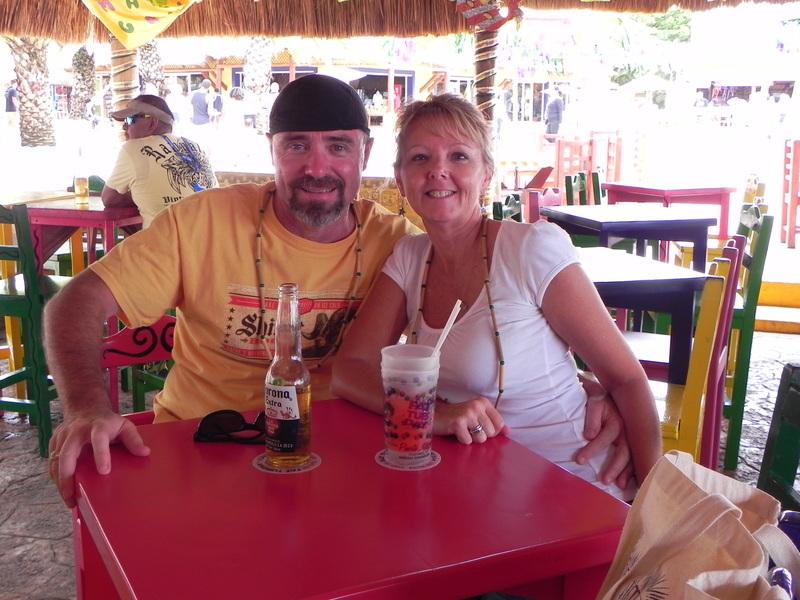 It was a quick, five-day cruise, with two stops in Mexico to do a little shopping to get my favorite color-changing nail polish at Del Sol and a little beach bar relaxation at Fat Tuesday’s. 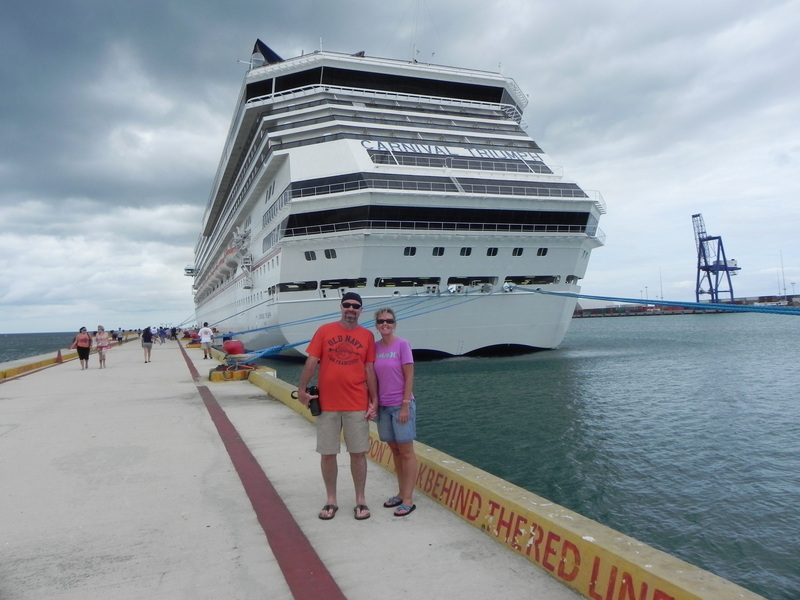 And yes, if you look close, you can see (or maybe you can’t see it) we sailed on the Carnival Triumph. Yes, the same one that broke down and left all those people with only Spam to eat! My daughter couldn’t believe that we were brave enough (or maybe she thought we were just down right stupid) to sail with Carnival, much less on the same ship! But we weren’t the least bit worried. (Okay, maybe just a little…in the back of my mind) Therefore, I did hoard some banana bread every morning after breakfast in our room…just in case! This is probably one of the reasons that Mr. and I both gained several pounds this cruise! After we got back from our cruise, Mr. took me to Corpus Christi for lunch. We had eaten at Fajitaville in Corpus last spring and they had the best fried stuffed avocados. We were sooo disappointed when we found out they were under new management and were no longer on the menu! 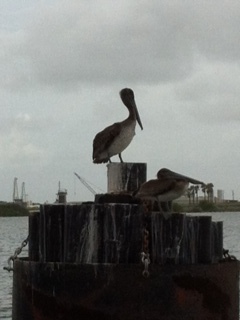 No worries, we had some good fajitas, a drive along the water, stops at the tourists shops, and a ferry ride at Port Aransas, complete with pelicans. So you see, distractions are always good! Especially if it involves the beach! This entry was posted in Trips and tagged Carnival, Corpus Christi, cruise, Del Sol, Fat Tuesday's, Galveston, Mexico, nail polish, pelicans. Bookmark the permalink.